The new EU General Data Protection Regulation (GDPR) rule looms in May 2018, but only a third of companies are on track to be compliant by the due date. GDPR is the most significant change in data privacy regulation in more than 20 years. It represents an extraordinary shift in the way businesses will be expected to operate when they gather, process, maintain, and protect customer data. Any organization that retains information of EU citizens must be in compliance or face huge fines of up to 4% of worldwide turnover. 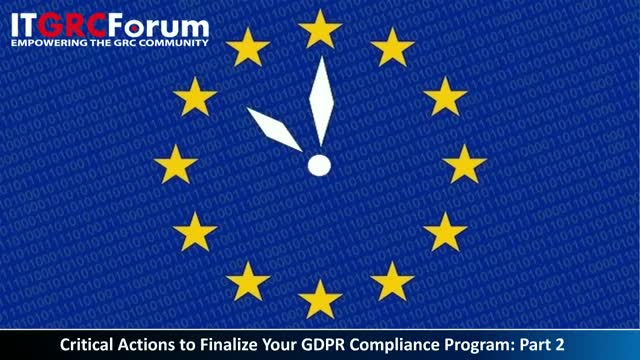 In this webinar series you will hear from industry experts facing the same challenges you face and find out how they're meeting and surpassing critical implementation check points, and you will learn what actions other organizations are taking in preparation for data protection – not only for GDPR, but for long-term data protection.